Chicago’s 94-80 win on Monday is Boston’s 10th straight road loss, dating back to early February. CHICAGO — Mike Dunleavy had 22 points to lead five Bulls in double figures and Chicago broke open a close game with 13 straight points at the start of the fourth quarter to beat the Boston Celtics 94-80 Monday night. Joakim Noah had 19 points, 11 rebounds and five assists, Jimmy Butler added 18 points, Carlos Boozer 16 and Taj Gibson 14 points and 11 rebounds. 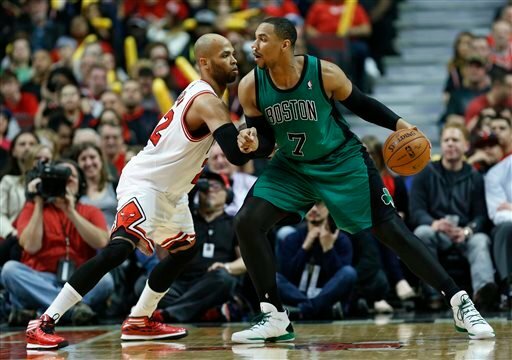 Chicago swept the home-and-home series with the Celtics after posting a 107-102 victory in Boston on Sunday. The Celtics have lost 10 straight on the road to drop to 8-28 away from home. Their last road win was Feb. 10 at Milwaukee. Brandon Bass and Jerryd Bayless scored 18 points apiece for the Celtics. Rajon Rondo didn’t play Monday after having 17 points and 11 assists Sunday. He is still working his way back to full strength following reconstructive knee surgery and doesn’t play in back-to-back games. The Bulls led 25-24 at the end of the first quarter, but the Celtics rallied in the second to take a 50-48 lead at halftime. Bass led Boston in the second quarter, scoring eight points on 3-for-3 shooting in nine minutes. Bass and Bayless each had 10 first-half points to lead Boston, and Butler led the Bulls with 12 points. The Bulls jumped back on top at the start of the second half, taking a 59-55 lead with just under seven minutes and seemed on the verge of taking command. But the Celtics rallied again for a 63-60 lead a little past the halfway point of the third. Dunleavy then tied the game with a 3-pointer that began a streak of nine straight points as the Bulls took a 69-63 advantage with about two minutes to go. The lead was down to 71-70 entering the fourth quarter, but the Bulls went on a quick 9-0 run for a 80-70 lead with 9½ minutes to play before Celtics Coach Brad Stevens called timeout. The stoppage in play didn’t curb the Bulls’ momentum or end the run. Gibson scored on thundering dunk off a nice feed from Butler to make it 82-70 and Noah capped the run of 13 straight with a post move for an 84-70 lead. Noah had six points during the run, including an 18-foot jumper before Boston’s timeout. NOTES: Home-and-home series on consecutive games used to be a regular occurrence in the NBA, but are rare these days. “It’s the same plays, so there’s a tendency for the players to know what’s coming,” Thibodeau said. “I think it’s good preparation for what’s coming down the road.” … Since he wasn’t playing, Rondo spent part of the game working on the TV broadcast back to Boston. … Noah had 13 assists in Sunday’s game, the most ever by a visiting center in Boston. The previous high was 11 by Wilt Chamberlain in 1968.